I mentioned earlier today that Melinda was talking to Ella on the telephone. If you don’t know what a telephone is, it’s an old fashioned long distance conversation device that restricted those using it to just hear each others’ voices. I suppose there was some advantage to this, like for instance if you were just getting up in the morning (right, Melinda?). But gimme a break, really. It is just so much more human to be able to see who you’re talking to. Given that, Melinda and Ella switched their conversation to Facetime, a handy little application that is part of iPhones, iPads, and iDon’tknowwhatelses. 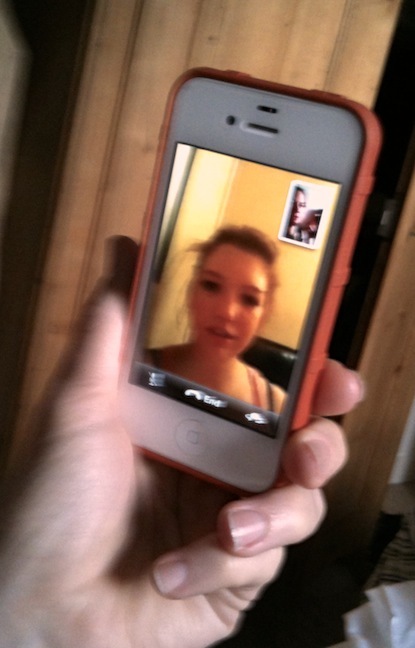 I snapped this picture of Melinda’s iPhone as she & Ella chatted. « 30 June 2013 : Sunday Morning, We’re Wide Awake! Niiiice… and thanks for introducing me to Corb Lund!